This is the first day of what I hope will be a year long adventure in pie baking. I’ve been baking for many years and wanted to find a way to express my gratitude to my friends, my family, the universe… and decided that I would bake a pie of one kind or another every day for a year. Each day I will find someone to give a pie to. That person could be a friend or neighbor who I know could use a pick-me-up… or maybe it will be someone that I don’t know yet… but who has come to my attention via this blog. Today’s pie (my first of the year!) 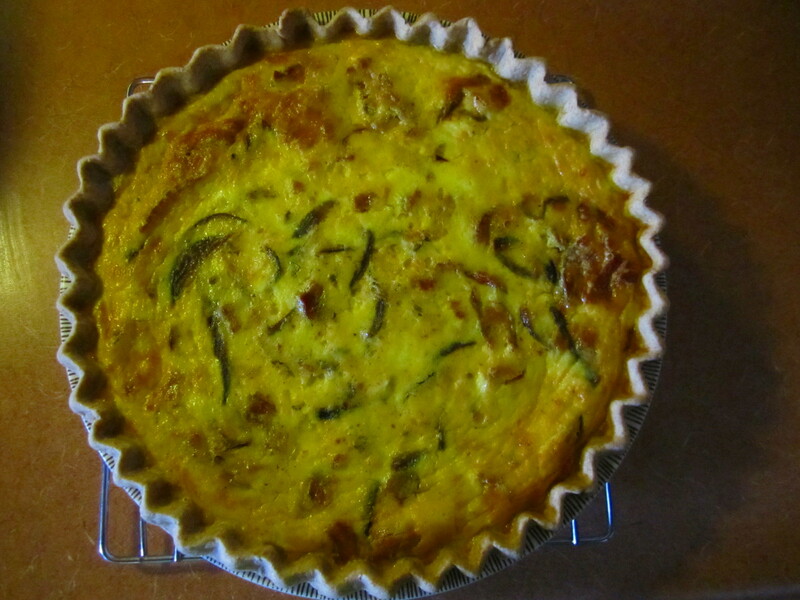 was in the form of a quiche – Quiche Lorraine – and it was delivered to a dear friend who I had not seen in quite a while. I’ve long been a fan of the book/movie “Like Water for Chocolate”. In this film the lead character is a wonderful cook who infuses the foods that she prepares with the emotions that she is feeling at the time. I hope to infuse the pies that I make with love and good wishes to all that receive them. Please join me on this journey. There are many ways that you can become a part of this voyage. Perhaps you will share your favorite pie recipes with me. Maybe you will suggest a person who needs their day brightened. Or maybe you will find a way to send me pie tins that you don’t need that I may use for this experiment. Whatever way you choose to participate, I welcome you. Thanks for your support! I love this idea, Karen! It will be interesting to see all the places your gifting takes you. Mmmmm, it looks lovely! I am so excited to see what you come up with every day… it will be an absolutely treat to look forward to! Dear Karen, this is Kristian from Denmark. I am very excited to read about your new project!!! Unfortunately – what with english not being my first language – I’m a little confused as to what defines a pie: Is it with fruit? Is it with a hard crust? Will it go with the Dukan diet? Looking forward to seeing many more pies, whatever a pie may be. What a blessing and refreshing breath of fresh air you are- Your thoughtfulness is amazing and your pie project is creative and unique. Thank you for including me in your project. I am honored-, and the pie incredible.